Animal Aid Abroad Trip 2019- It’s a Wrap! On January 5th this year, ten devoted Animal Aid Abroad members, from across Australia, dug out their money belts and Gastro-Stop and joined forces with AAA founder, Janet Thomas, and travelled to several AAA partner group locations to see, first-hand, how the donations from our wonderful supporters is being used to assist working animals by relieving their suffering and providing them with some comfort such as nutrition and shelter. After an ‘overnighter’ in Colombo, to recover from the ten-hour flight, the group headed off to our first destination, Mannar, in the far north of Sri Lanka. After stop overs in the historical and cultural sites of Anuradhapura and Dambulla, we arrived at Mannar and spent a memorable 2 days with Jeremy Liyanage, Director, Bridging Lanka who gave us a wonderful tour of the Donkey Rescue Centre which was only opened (after much bureaucratic difficulty) just over six months ago. 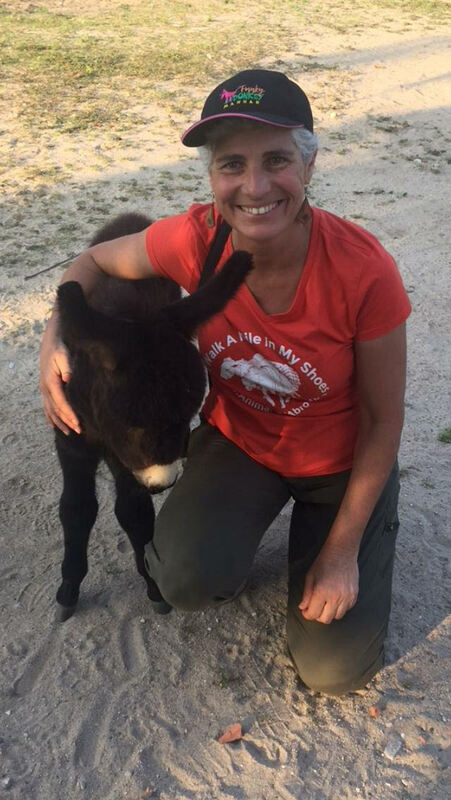 Here we had the pleasure of meeting 25 sweet donkeys who had either been rescued from the streets following motor vehicle injury or abandoned and left to survive on scraps and with an uncertain future. Three of our team promptly fell in love with, and each sponsored, a resident donkey – Egan, Joy and Mellita, who now have the security of financial support (meaning bed and breakfast).…well deserved after a rough life that brought them to the sanctuary. Bridging Lanka also runs a Donkey Assisted Therapy (DAT) Centre nearby, where local disabled children have the opportunity to develop co-ordination, find physical confidence and grow from interacting with these lovable and gentle creatures. Bridging Lanka faces the constant and challenging task of changing local attitudes towards donkeys in Sri Lanka and raising their profile so people will not harm them or will report cases of cruelty or injury. Back to Colombo to catch our flight to India and we were soon landing in Jaipur, Rajasthan. 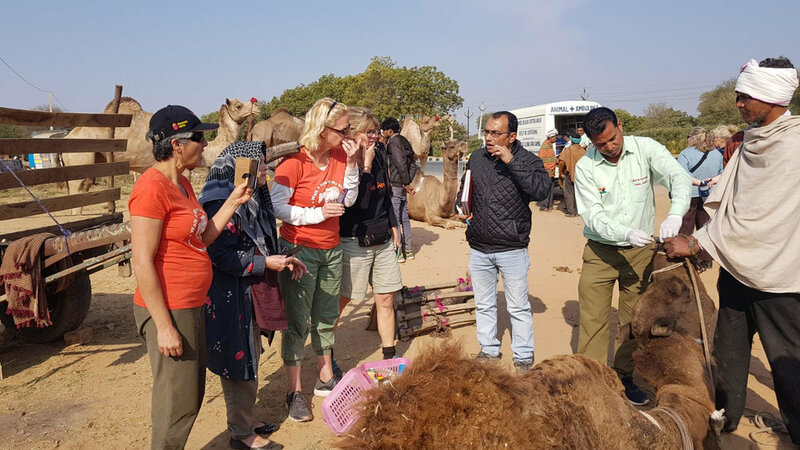 Our time in Jaipur took us to the fabulous Camel Rescue Centre in Bassi, supported by Animal Aid Abroad and led by Dr Abhinav from the wonderful Help in Suffering (HIS) organization. We met camels, donkeys, horses and some cattle all being provided care by HIS, along with a large and feisty welcoming committee of eclectic canines who provided endless hugs and face-licks. We were also lucky enough to join Dr Abinhav on a couple of mobile clinics where he provided treatment and advice to several locals who brought their camels to a pre-arranged place in, what appeared to us, to be the middle of the highway somewhere outside of Bassi. Next, we spent time at the city site of HIS where a variety of rescued animals, large and small, are provided with veterinary care, a good diet, warmth in the winter and some TLC. HIS also runs a clinic where locals can bring their pet dogs for veterinary treatment. Encouraging responsible dog ownership and running a highly successful Animal Breeding Control (ABC) program (i.e. sterilization of street dogs) are also included in the achievements of HIS. An early morning train journey then saw our group disembark at Gurgaon - just outside of Delhi. Here we visited the site of Friendicoes SECA (one of Delhi’s largest animal hospitals), where several animals are sponsored by Animal Aid Abroad supporters. Geeta Seshamani and Dr Akhilesh run a large team who rescue, treat and provide homes to injured/ roaming cattle and equines. Presenting with a variety of injury and disease, these large animals can now live in safety and basic comforts. Friendicoes also has a large on-site rescued canine family (over 600 dogs!) creating a lot of noise and needing a lot of love, but somehow living in harmony. Our group also had an uplifting few minutes in the feline enclosure, where many cuddly cats were looking very happy and relaxed amongst multi-tiered climbing platforms, soft blankets, hidey-holes and plenty of cat treats and clean water. Onto the near-by city of Faridabad, where Ravi Dubey runs the amazing People for Animals Trust who accomplish wonders on a shoe-string budget: Ravi and his team drive their AAA sponsored water tank weekly to their strategically placed water troughs (plus natural dams) in the city and outer forest areas ensuring street, working and wild animals get enough clean water. Ravi also supervises a small, battling veterinary clinic in the city of Faridabad where his vet treats dogs, cats, equines, wildlife and cows for a range of, often severe, injuries and illnesses. They do what they can, with very little resources and space; the animals that make it to his clinic look struggling and dire, but they are the lucky ones – to have been rescued from the street. Last year Animal Aid Abroad assisted in funding PFA’s first rescue vehicle which is used daily in the city of Faridabad. With heavy hearts, from the relentless hardship we were witnessing that the animals of India endure, we moved onto Friendicoes city shelter location in central Delhi; here, dogs from all walks of life (and streets of Delhi) surrounded us – many maimed, blind, diseased, malnourished, pregnant etc. Many that would bring a tear to the eye of you and I due to injury or disfigurement, but somehow have the fight and spirit to still show huge enthusiasm when someone approaches them for a hug or a play. You can’t help but want to sweep them all up in your arms. A large clinic with several vets, here they rescue injured street dogs and also treat the pets of local Delhi residents. They also run a successful ABC program (sterilization) for the street dogs of Delhi with outstanding success and helping them to be at least acknowledged by the local government for assisting in the street dog population problem of Delhi. We were honoured to be shown around by the amazing and famous, Geeta Seshamani, founder of Friendicoes SECA and Wildlife SOS and she explained the incredible challenge it has been to establish (and keep running!) this city shelter. Buoyed by the persistent efforts and optimism of Geeta and her team (and after buying out most of the merchandise store to support Friendicoes! ), we bid farewell to the whole motley crew of canines and wished them well in their uncertain lives. A brief flight to Kathmandu saw our group arrive at modest (but most cosy!) accommodation high on the peaks in this city built on steep, narrow roads. Plenty of hearty food like dahl and rice before bed, and the next morning we were off to visit the donkey sanctuary established by Animals Nepal. After a long drive (narrowly avoiding scooters, pedestrians and street dogs) on dubious, steep dirt roads, we arrived at an oasis of quietness and tranquility where approximately 30 equines are living out the remainder of their lives – mostly rescued from the harsh conditions of working in the brick kiln sites dotting the hillsides in outer Kathmandu. 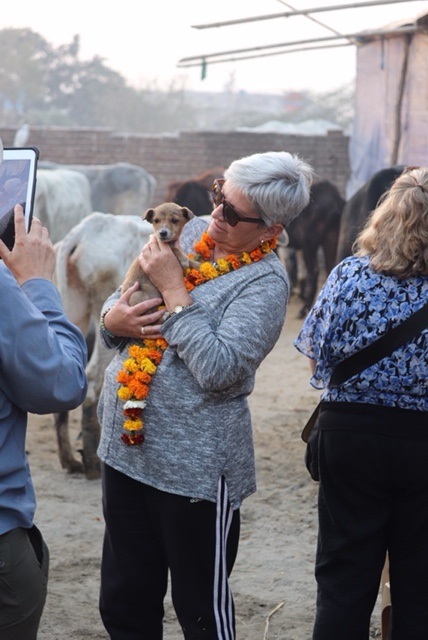 Pramada Shah, founder of Animal Nepal, Hari Joshi and their very dedicated team were keen to show us their new Sanctuary and meet their family of equines, goat and dogs. 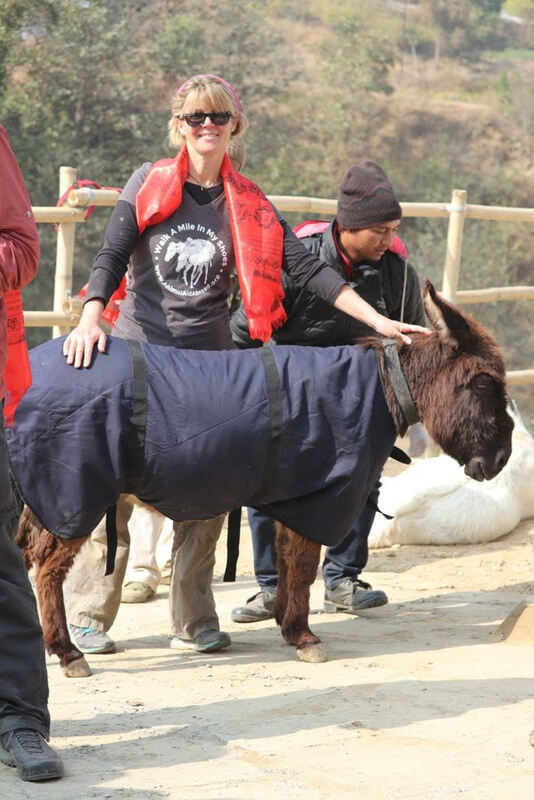 AAA supports many donkeys, mules and ponies living at the Animal Nepal Sanctuary, and while there we supplied funds for four new equine blankets to protect several of the older donkeys from the cold winter chill at night in this region. Menuka and BB, already sponsored by AAA, are two of the lucky ones who will now have some extra comfort at night. Many a photo opportunity with these sweet and docile furry creatures later (while avoiding the grumpy charges of the resident goat who protested when you stopped scratching his rough, wiry head!) and we shared a hot cup of black tea and biscuits while discussing future plans and hopes for the donkeys whose fate is in the brick kiln factories, and how Animals Nepal can intervene and assist while being culturally and economically sensitive so as to keep the factory owners ‘on side’ - this is crucial so that the amazing veterinary team (led by Dr Atish) at Animals Nepal can enter regularly to check and treat any donkeys or horses and also negotiate with the owners if there are any deemed to be removed due to injury or age. Ideally, the owner agrees and permits Dr Atish to translocate the donkey to the sanctuary for the remainder of his or her life. While at the kiln site the next day, our group saw two donkeys that we requested could be removed and taken to the sanctuary - one with a historical broken lower leg that had now healed incorrectly, and the other with a symmetrical hind leg deformity resembling a sort of congenital (but never treated) problem. Animals Nepal agreed that, following quarantine, all efforts would be made for these two to be transported to the sanctuary – phew!! AAA will sponsor these donkeys, now named Jackie and Saffron. We were able to watch the vet team treating many more equines at the kiln site, and could only hope that one day brick kiln factories such as this will all move to vehicles and motorization for the hauling of bricks. And in the meantime, we hope that good relations with groups such as Animal Nepal, result in the on-going treatment for these equines and the ultimate removal of many to the peace and safety of sanctuaries for the remainder of their days. At each of the partner groups we visited, AAA was able to give a collection of medical disposables that were kindly donated by a variety of sources back in Perth. This included bandages, dressing, needles, syringes, antibacterial cream / spray, temporary splints and even some dog toys, and was greatly appreciated by each and every vet and their team. It was very rewarding to contribute, even if just a little, to the care and treatment of these very special patients. The recent AAA trip, which covered three countries in 17 days and saw countless animals – both in treatment and on the streets, only captured a minuscule fraction of the animals in need. Without organisations such as Bridging Lanka, PFA, Animals Nepal, Friendicoes and HIS (and, in turn, groups like Animal Aid Abroad who financially assist them), animals such as the ones you have just read about would remain in dire situations; slowly starving, freezing from the cold, dying from injury and / or disease on the streets. We know we are not saving each and every one, but for each animal we can help, it makes the world of difference to them.